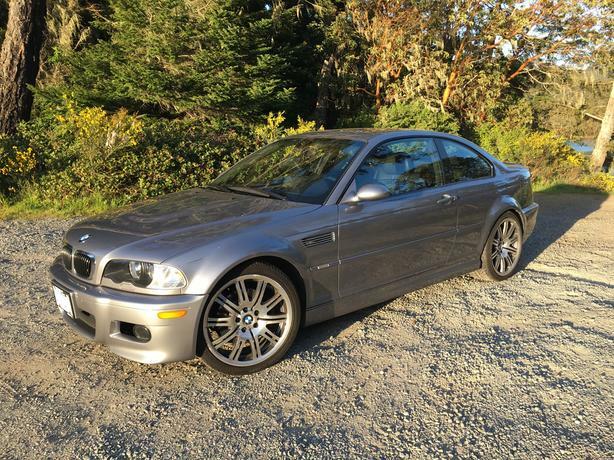 2004 e46 BMW M3 grey with black leather interior. - Exterior is in very good shape with exception of the two flaws below. - 19" wheels with some curb rash on the passenger side. - Have all manuals, paperwork, tool kit, and original equipment etc..
- One fog lamp is cracked. - Slight dent on small section of roof trim. I am reluctant to let this car go, however, a baby is on the way and I am looking for something a bit larger. Serious buyers only, please. Will consider a full or partial trade for a newer full cab truck or an M5.